I love reading about snow. I love cozy images of the Ingalls reading magazine serials next to a fire or snowbound Betsy making a store in her attic. And don’t even get me started on the snug fun had by “Little Women.” Snow as a reality is not so charming and homespun. I have been struggling big time with living in Wisconsin. And not just for CNN-worthy reasons. Digging out your car on a chilly morning in order to drive to work gets old after a while. Actually, it gets soul-crushing after a while. I struggle to be creative, productive and engaged. Which is challenging when my job is to engage students in creative, productive ways. I struggle to think long-term and bigger picture, but the reality is that I am an inspired thinker. I get ideas brushing my teeth or listening to the radio during my hour commute. I got one of those inspired ideas that sounds average, but give me your time: a scavenger hunt. You are groaning internally now. I hear it, s’okay. 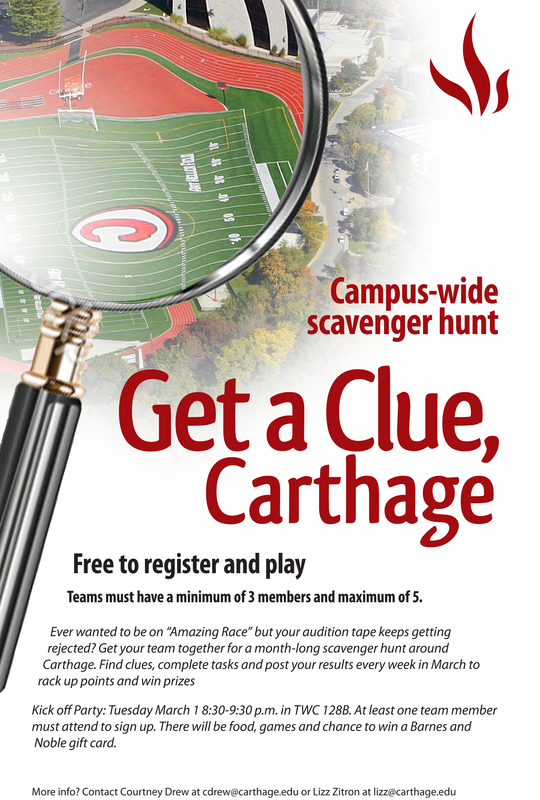 We’ve all done a freaking scavenger hunt for orientation activities, right? Well, hold your horse and lend me your ear (and forgive me for mixing metaphors.) I approached our Dean of Students office about co-hosting a month-long, “Amazing Race”-inspired scavenger hunt to promote underused resources and services on campus. Each week teams would uncover and follow clues leading them to a task. They would have until 11:59pm on the Sunday of each week to post evidence of their task on our Dean of Students Facebook page (but you could use your library one.) We decided to hold a launch party and five minutes before the party, with one person in attendance, we felt like little girls hoping someone would come to our birthday party. Suddenly the launch party started and 30 people filed into the room. I don’t think it was just for the free cookies and taco dip (but in my experience that helps). We started out by playing Human Bingo (telling them it was a test in how well they find things) and gave a $10 gift card to our campus bookstore for the prize. We went over the rules (don’t do anything stupid or illegal, don’t cheat, be nice) and then had them make a team flag out of craft supplies we brought. They filled out a form with their team name, captain and members. When they completed their flag they got their first clue. The first week we wanted to highlight an exhibit of faculty and staff art in our campus gallery. After visiting the exhibit as a team, they had to reinterpret their favorite piece and then get their picture taken (with their art piece in hand) with the artist. The gallery director was thrilled with the opportunity to get more visitors. The students got to meet staff or faculty they might not have known before. And the students really worked hard! No stick figures. Some students even documented their process (created by Cassandra “Kiwi” Pruitt, featuring teammates Kenna Krone, Amy Tucek, Ellisa Mullen, Sarah Anderson). We structured it so that each week the team captain would get the first clue on Monday. The clues were often put in places (both virtual and physical) that students don’t often visit. For example, I took a picture of a specific locker in our rec center, cut it up and made a puzzle they had to put together. It came with a math problem (using numbers significant to our school) that gave them the locker combination. Inside the locker were magnets advertising our library’s help request system. By filling out a help ticket, they got a clue sent to them. Other times we hid clues in the library catalog, in our online self-help knowledge base, in Dean of Students’ policy web pages and so forth. We’ve ended up with 10 teams competing madly against each other each week to win. It’s been amazing to see what they come up with and how they interpret tasks. One team ended up making a faux freshmen orientation video (Team Five Hooligans) as their entry one week. We’ve been able to highlight the cool technology equipment and software we provide at the same time by asking them some weeks to create multi-media entries. We direct them to our Media department to obtain the resources and services they need to complete tasks. Partnering with another department takes the pressure off me to write, plant and monitor clues all month. Plus, it widens the scope of the hunt and therefore the interest of the students. We’ve already been asked if we are doing it again next year. On a personal level, it’s helped me connect with students I didn’t know in a fun way and I get to see how creative and innovative our students are. And, my winter is a tad less dreary.